As some might remember, I kind of like the Magic Sixes Screen (P/E < 6, P/B 6%) initially mentioned by Peter Cundill. Many of the “Magic Sixes” companies are declining and/or cyclical companies which do not score well on my Boss Screen which is looking for stable companies. The exception at first sight seems to be French DIY chain Mr. Bricolage. ROE is clearly not overly impressive but one should not forget that the company trades at 0.4x book. A company which generates 10-11 % ROE should not trade at that level. Free Cash flow generation is very volatile, but 0.70 EUR on average per share looks ok and covers well the dividend paid out over the last 11 years. a) why is the share of intangible so high and is it valuable ? b) why is the stock so cheap (if the intangibles have value) ? 2009: Briconautes Group, however no prices disclosed. So at a first view those acquisitions (other French DIY chains) seem to look ok. An interesting bit of the linked article shows that Mr. Bricolage seems to be the 3rd largest French DIY group with ~13% market share at that time. As far as I know, the barriers to entry in France for DIY stores are relatively high, on the other hand the market is much more concentrated than in Germany, where the largest Group ahs only ~15% market share. I am not sure but I don’t think that being number 3 by a large distance is a very comfortable competitive position. Of course, retail is very local but as Walmart shows, certain size advantages with regard to advertising etc. exist. Interestingly, Bricorama, the number 4 is listed as well. However at a first glance it doesn’t look really cheap and/or attractive to me. Mr. Bricolage has a very different business model than the two German listed companies, Praktiker and Hornbach. Mr. Bricolage does run its own stores, but the majority of “gross sales” runs through Franchise partners which carry one of the Mr. Bricolage brands. 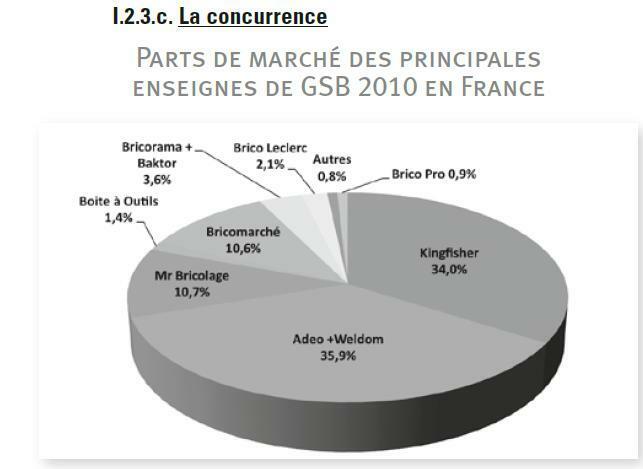 Mr. Bricolage itself shows sales of ~560 mn EUR in 2011, “network sales” have been something like 2.3 bn. If we were to be prudent we would deduct the full Goodwill for the stores (70 mn ) from the Goodwill, which would reduce book value by ~ 7 EUR per share to something like 16 EUR. Still cheap but not so cheap than before. So to sum up the business model so far: Mr. Bricolage has a loss making chain of own stores and a quite profitable franchise business. An operating margin of 16.5% is not something you see usually at any retailing company. At first glance it looks like the need 160 mn of Net assets, so return on equity for this segment is not that spectacular. 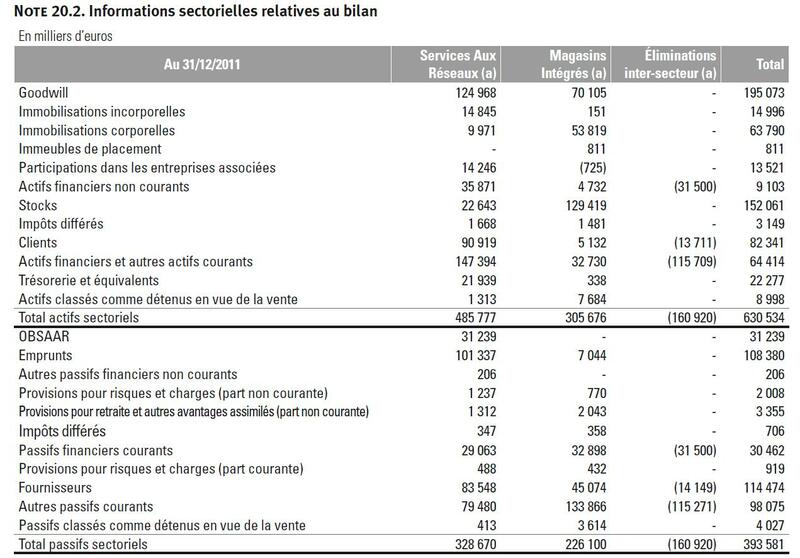 Howver we see that especially two position where the Franchise sectors has big asset positions, “Actifs financiers non courant” and “”Actifs financiers et autre actifs courant” are mostly consolidated out in the group, so this looks like that the Franchise sector is basically funding the own store sector. This as a consequence means that the franchise sector itself could run with very little capital and producing incredible returns on capital. A quick check of the capital structure shows us that Mr. B has something special there as well. From what I understand they have issued something like a convertible bond or bond with warrants which converts at 16 EUR per share (ISIN FR0010814178). The bond itself is maturing in 2014 but with amortization starting already in 2012 (1/3) and 2013 (1/3). There is some more information here. I am not sure if the warrants are still attached but I haven’t seen them trading seperately. Anyway, so we have around 20% potential dilution at EUR 16 which of cours puts additional limits on the upside. So for the time being I will stop here and not further investigate the stock. However if at some point in time a sale of the own stores would be announced or they are able to turn them around, the company might become interesting. As a side effect and to complete my journey into the Eurpean DIY area, I might look at Kingfisher at some point in time. I am always surprised by the low turnover (and in general low number of listed bonds) in the European small-cap bond markets. You are right, of course, at 100% this bond is not interesting. Could you share some more of your thoughts on the bond? The yield to maturity seems interesting if you assume the company will not default on its debt over the next years. Thanks. from what i see, the last trade in the bond ahs been in June. The only offer i see is at 100%, but i do not know if this is real. There is still some option value in there but at 100% it is not interesting. Thanks for the analysis. Of course one can always speculate if hard times in France plus inflation risk will lead customers to consume more and invest especially in home-improvement (plus saving by doing-it-themselves). However, from a bottom up analysis the issues you pointed out seem quite real. Thanks for the analysis. One thing I am not sure about is how the franchise PL is taken into account: is it really the PL of the underlying stores or is it the franchise cost paid to the group? I cannot remember in which book I read the following story: expanding restaurant brand on a franchise model. Franchisees need to pay a fee so the listed company looked very profitable. The issue is that the stores were losing money. So you could guess that a lot of franchisees would go bust and stop paying the premium. Did not end up well for the group. there is no indication how the franchisees are doing. However there is one interesting thing: The Franchisees more or less own Mr. B. So it is quite unrealistic that the owners would allo Mr. B to loot themselves.